Brian Johnston Lecturer, School of Health, Nursing and Midwifery, University of the West of Scotland (UWS), Paisley. Liz Boyle Reader in psychology, UWS, Paisley. Ewan MacArthur Senior lecturer, School of Physical Sciences, UWS, Paisley. Baltasar Fernandez Manion Professor, Facultad de Informática, Universidad Complutense de Madrid, Spain. There is growing evidence that using e-learning and digital gaming technology can support students in their learning. An international project, Continuing/Higher Education in Research Methods Using Games, funded by the European Commission’s Lifelong Learning Programme and led by a team at the University of the West of Scotland, aims to develop interactive activities and games to support nursing and social science students. 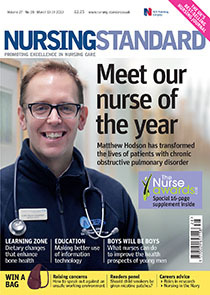 This article looks at the scope of the project in helping to deliver nurse education.